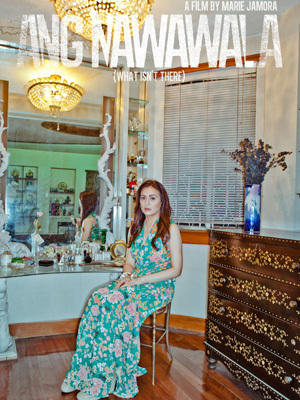 One of the most promising—and the one with the most buzz—of this year's crop of independent bigscreen goodies from the 2012 Cinemalaya Film Festival is Ang Nawawala. The festival opens today and runs until July 29, with screenings to be held at CCP, Greenbelt 3, and Trinoma. Tonight is also the gala premiere of Ang Nawawala. The film is headlined by veteran actors Dawn Zulueta and Boboy Garrovillo, and also stars talented young actors Dominic and Felix Roco, Alchris Galura, Mercedes Cabral, Kelvin Yu of The Itchyworms, Jenny Jamora, Marc Abaya, and Sabrina Man. Playing a big role in the film is actress Annicka Dolonius. "Ang Nawawala is a family drama that is centered on Gibson Bonifacio (played by Dominic Roco) who stopped speaking when he was a child. Now twenty years old, Gibson returns to Manila from his studies abroad, his first visit in three years. He finds his family trying to keep it together as his mother (played by Dawn Zulueta) is still hurting from a tragic loss in the past. Against the backdrop of the vibrant local music scene, his childhood bestfriend tries to reconnect with him as he unexpectedly finds a chance at a first, real romantic relationship. Amidst the holidays, Gibson reconsiders and redefines his relationship with his family, friends, and with himself." The film is helmed by music video director, Marie Jamora, and is co-written by Ramon de Veyra. This being her first full-length feature film, Marie admits that while she's so excited to finally see her "dream project" come to fruition, she's also scared as to how it will be received. We're thinking it's going to be pretty good, based on the trailer alone. Also, it features performances from local acts including Sandwich, Pedicab, The Itchyworms, Hannah + Gabi, Flying Ipis, Outerhope, Tarsius, and Ebe Dancel, many of whom made original songs for the film.